When one looks back on the 1980s comic book industry as a whole, the more observant reviewer will probably draw parallels between DC’s Teen Titans and Marvel’s X-Men - mainly for the fact that they were both ‘team’ books and hot properties for their respective companies*. 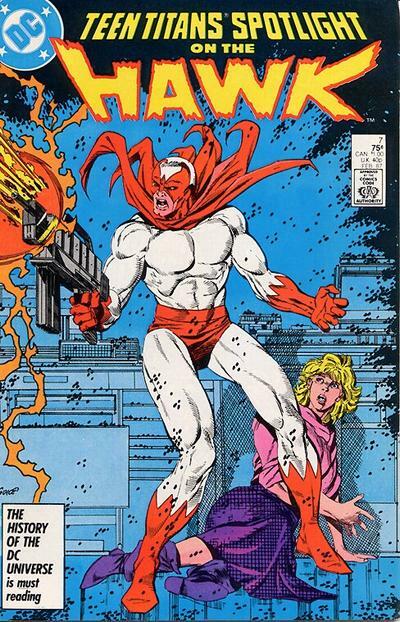 Knowing a good thing when they saw it, Marvel created several spin-off 'X-books’ (i.e. X-Factor, Excalibur, New Mutants) throughout the decade. 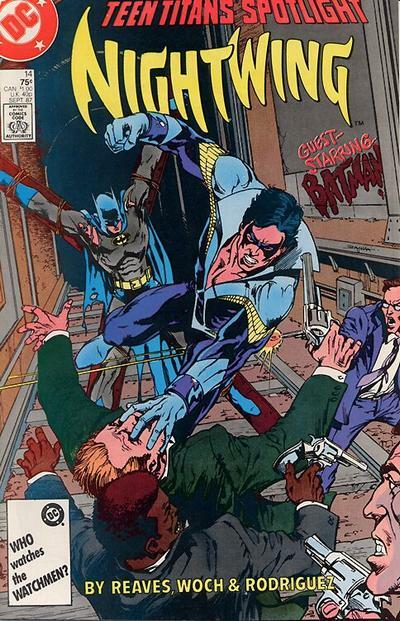 DC also had the same idea and the 80s saw various Teen Titans spin-offs such as 1982’s Tales of the New Teen Titans, 1984’s Baxter edition New Teen Titans ongoing series (set 1 year in the future from the current Tales of the Teen Titans ongoing series), and 1986’s Teen Titans Spotlight On… series. 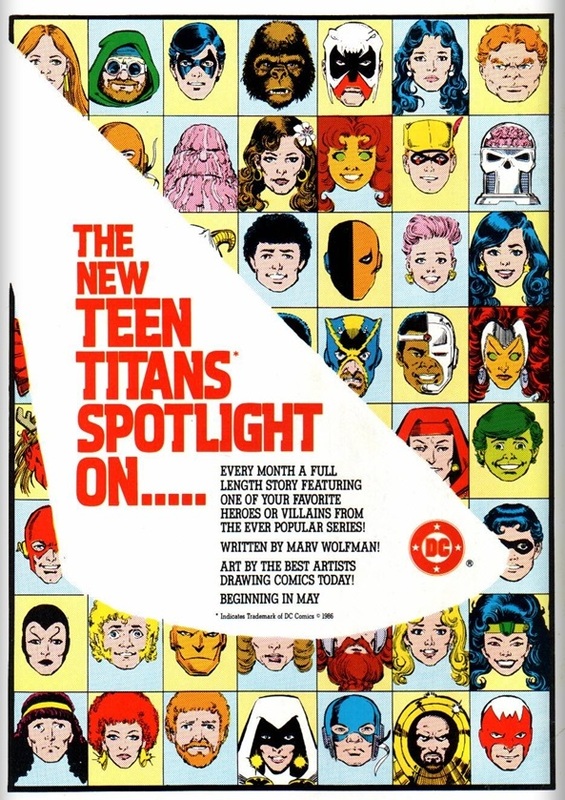 In Marv Wolfman’s own words, the Teen Titan Spotlight On… series was inevitable as Wolfman had different characters he wanted to explore within the Teen Titans universe and he really couldn’t deviate from the story lines of the regular series to focus attention on any individual characters (at the risk of alienating the rest of the team). 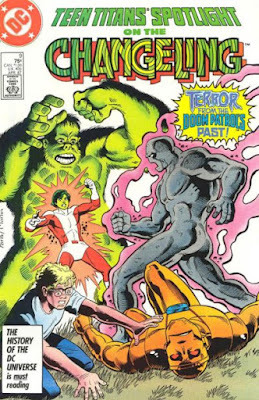 In my opinion, Wolfman did something brilliant with this series - as opposed to writing all of the issues himself, he had some of DC’s top talent write the issues (while he still retained creative control) - this allowed writers who were not normally affiliated with the Titans to bring a different perspective to the series. You can probably go ahead and call this an 'anthology’ series, due to the creative teams changing with almost every issue. 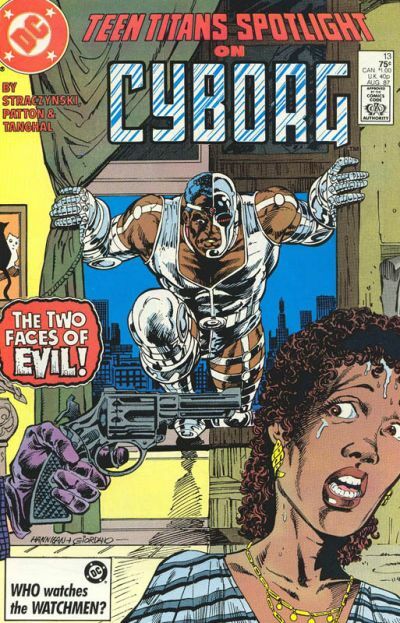 For anyone who may be concerned - yes, George Perez still contributed covers to the series. I’m kind of feeling this series was overlooked by the fans due to it being a spin-off and all. This is a shame, since if you are a Teen Titans fan/DC continuity hound like myself, this series is absolute gold. As mentioned, there’s lots of attention given to secondary characters who don’t normally get much characterization, so it’s always nice to see something like that. Due to space constraints, I’m basically going to give an overview of the highlights of this twenty-one issue series. 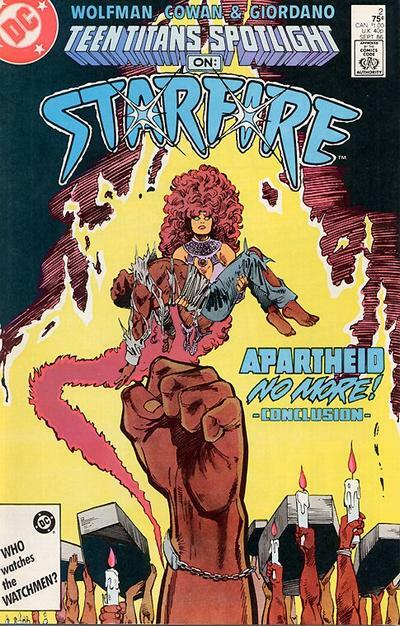 The series debuted with a two-issue Starfire story in which she tries to battle Apartheid (with a little help from a character who looks strikingly familiar to Nelson Mandela) written by Wolfman himself. The story dealt with real-word issues (concerns of social and political relevance injected into the story line) and Wolfman inserted a few subversive political statements, but the main goal was to raise political awareness about the war in South Africa. 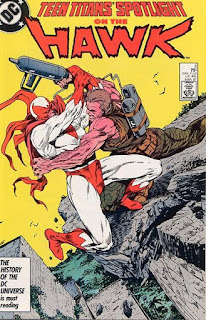 The first issue was not submitted to the Comics Code Authority for approval (contained crucial story elements that were in violation of code) and therefore does not have a CCA seal on the cover. These issues received a lot of press, as Apartheid and South Africa were all over the media in 1986. This storyline received mixed reviews from readers, but great attention from the media. Starting a new comic book series with a controversial story line was a very intelligent marketing move, Mr. Wolfman. 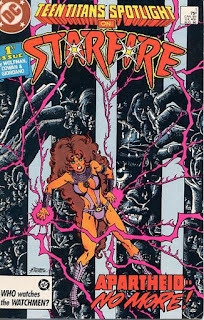 Wolfman later went on to say that he did not wish for Teen Titans Spotlight On… to become "the relevant comic of our time", and the series pretty much stayed away from topical issues after that. A few lesser-known Titans get some attention in this series, namely Jericho (Deathstroke’s son), Aqualad, Wonder Girl, Thunder & Lightning, and Frances Kane/Magenta. Frances Kane/Magenta (who many fans compared to Marvel’s Polaris) became a recurring character in Flash v2 several years later. True story: Frances Kane’s superhero name, 'Magenta’, was pretty much invented on the fly by Barbara Randall, Tony Isabella and Wolfman before the issue went to print. Hawk (of Hawk & Dove) got a two-issue solo story written by Mike Baron that takes place sometime between the death of Don Hall (old Dove) and his introduction to Dawn Granger (new Dove). This series was not immune to the Millennium company event and had two cross-over issues: one teaming Aqualad and Aquaman together (written by Dan Miskin and Gary Cohn), and another spotlighting Harbinger written by Barabara Randall (as a direct tie-in to the New Guardians series Steve Englehart was writing). 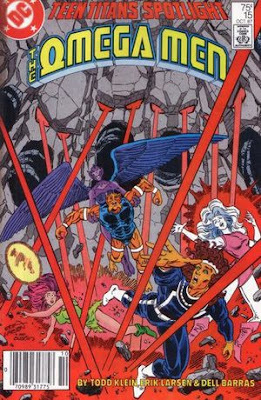 An Omega Men spotlight issue was included (written by Todd Klein and illustrated by Erik Larsen) which took place after the Omega Men series had been cancelled. What’s the Titans connection? Starfire’s brother is a member of the Omega Men and the Omega Men were created by Wolfman. Fans loved the issue (gave them a sense of closure) and hoped it was a prelude to a new Omega Men series (or at least more stories). 'Nay’ to both. Teen Titans Spotlight On… #13 (1987) was a Cybrog story written by J. Michael Straczynski that pitted him against Two-Face. During the 80s, the Teen Titans typically fought their own gallery of rogues (i.e. Fearsome Five, Deathstroke, H.I.V.E., Trigon’s forces, Blackfire and company, etc) so it was a pretty cool concept to have Cyborg battle a Bat-villain. It gave a nice sense of continuity reminding readers the Batman and the Teen Titans all inhabited the same universe, and it was a great story to boot. The last issue of the series, Teen Titans Spotlight On… #21 (1988) was a throwback to the 1960s Teen Titans team (Robin, Aqualad, Wonder Girl and Kid Flash) where they kind of play as a 'mod squad’ to combat organized crime. 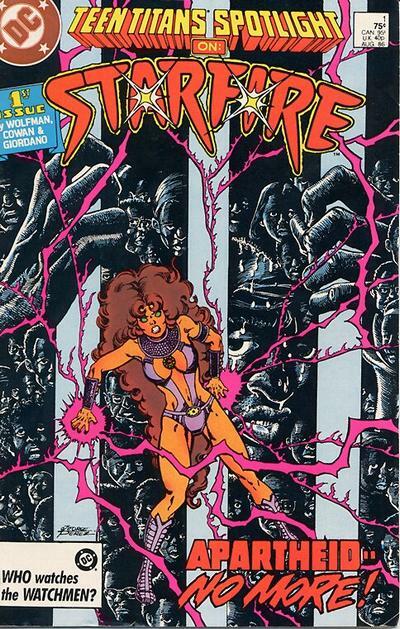 Written by Mark Evanier and Sharman Divono, it wasn’t a retcon, but it was inconsequential enough to be just slid in there and not really have any impact on Teen Titans history. 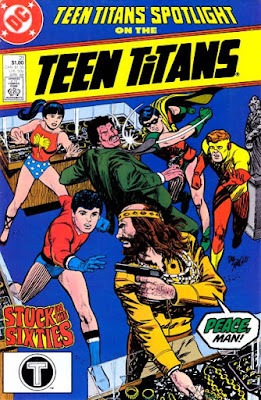 Dan Spiegle illustrated this issue, and if you don’t know who Spiegle is, he’s the artist that illustrated a large variety of Gold Key Comics titles from the 1960s, giving this 1960s Teen Titans story an even more 'authentic’ feel. Teen Titans Spotlight On… ended suddenly with issue #21. 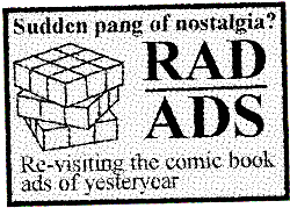 I say 'suddenly’ because there was no real fore-warning that the series was in any sort of trouble in regards to sales. Actually, it was teased in an earlier letter column that Raven would be having her own solo story in issue #22. The reasons given for the sudden cancellation was that Wolfman was too busy with other projects to keep overseeing this series, and the reason he was so busy was because other great Teen Titans projects were in the works (a new Titans team book, a Teen Titans graphic novel called ’Titans of Myth’ by Wolfman and Perez, and a Nightwing solo series). I seem to recall reading something about Perez stating that he no longer wanted to draw monthly issues of anything anymore, and that he would rather only draw Graphic Novels. None of these projects saw completion within the allotted time schedule, btw. Doug Moench wrote a Wonder Girl story that fans felt was a real missed opportunity to explain the whole post-Crisis Wonder Girl/Donna Troy origin which Wolfman had been promising readers for the past 2 years. Could you really blame Moench for not wanting to jump on that grenade? I’m assuming Wonder Girl/Donna Troy’s elusive post-Crisis Wonder Woman connection was going to be revealed in the Titans of Myth graphic novel Wolfman and Perez were working on. *In 1982, the New Teen Titans and the Marvel's Uncanny X-Men even had an inter-company cross-over. I wish I had read these. This was a series I would buy, but because Perez wasn't drawing it, I didn't give it the chance it deserved. This was also kind of a 'sleeper' hit for me. I only sought them out when I had read and re-read all of the 80s New Teen Titans stuff and thought "gee, i wish there was more from this era". They cover a wide range of characters. You can probably find them in flea market back-issue bins. Maybe someone can even find one or two and write reviews about them? <cough? 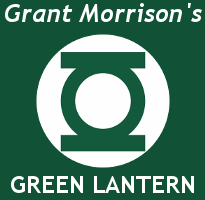 I hope that one of these days DC collects this series into a trade paperback. Also, I've been working on assembling a complete run of Omega Men for some time now, and that includes searching out a copy of Teen Titans Spotlight #15. Yeah, that's me. Thank you for the kind words. You have a great blog here, as well. Keep up the good work.